Wielding hydraulic tools like a breaker, backhoe, bucket or broom, a tool carrier can be the ultimate do-everything machine on a project site, but a tool carrier is nothing without its attachments. 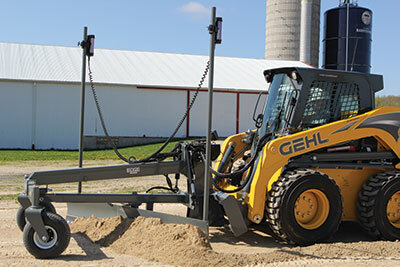 Compact Equipment is a magazine dedicated to tool carriers, machines like skid steers, track loaders, wheel loaders, mini excavators, telehandlers, utility vehicles and beyond, so that means we’re constantly covering the hydraulic- and PTO-powered attachments these machines utilize (from tree spades to silt fence installers). At the end of the year, we like to call out the coolest new attachments that entered the market. These next four pages are filled with pioneering attachments that can give your fleet a new multifaceted approach. Sit comfortably in your cab while you split logs — that’s our idea of work. The Black Splitter S2X 800 is actually a hydraulic wood-splitting attachment that enables an operator to split large timber with the precision of a surgeon without leaving the cab of a construction machine. 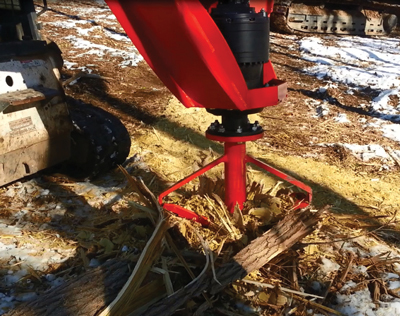 As with all Black Splitter wood-splitting attachments, the rotating cone can be used to maneuver and position individual logs before and after splitting. The 245-mm, rotating, threaded, chromium-steel cone has a replaceable tip. The cone is available with a double helical thread design with a thread pitch of 24 mm for rapid penetration into hard-to-process logs and stumps. For more info, visit blacksplitternj.com. Sometimes the job calls for grabbing, pulling, ripping and carrying obstructions. That’s when you call in Danuser’s Intimidator, which is a versatile tree, post, rock and everything puller. It’s ideal for eliminating trees, saplings, shrubs, stumps, bushes, boulders and clearing fence rows. Its unique design allows you to selectively eliminate what you want, whether that’s a rose bush or complete tree, roots and all. The replaceable excavator bucket teeth and vertical jaw saw teeth allow the operator to dig and cut roots to remove larger trees. The uniquely synchronized jaws, designed for less wear and tear on the vehicle, are actuated by a rear-mounted, fully-protected, 3-in. diameter cylinder, allowing you to aggressively excavate objects without fear of damage to the cylinder. The FX26 Defender by RockHound and BrushHound is the first mass-produced compact excavator-mounted shredder to utilize a “fixed-tooth” cutting surface and be capable of mounting to units in the 8,000- to 16,000-lb weight class. The constant struggle for contractors and equipment owners in this weight class has always been larger diameter material. With the FX26’s revolutionary cutting tool design, it can power through material up to 6 in. in diameter while being powered with as little as 15 gpm. Utilizing a unique “raker” style approach, the FX26 is designed to shave small amounts of material at a time with a very sharp edge, thus maximizing efficiency. This feature, in conjunction with the large cutter drum, means the days of additional oil cooling and power packs are gone. For more info, visit valleytoolmfg.com. This fall, Caterpillar unveiled new work tools designed to manage snow removal in the harshest weather conditions, including a state-of-the-art straight snow push. 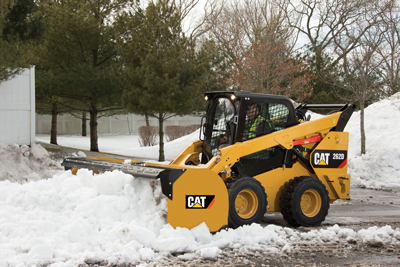 It can convert a Cat skid steer, track loader, wheel loader or backhoe into a clearing powerhouse regardless of the season. Cat snow pushers’ cutting edges, available in steel or rubber, are designed for moving snow in a wide range of applications. The pushes reach down to the surface and remove as much snow as possible, while the additional bolt-on back drag feature allows for a straight push to pull material away from a structure. A spring-loaded trip edge with tension adjustment allows these pushes to protect themselves. 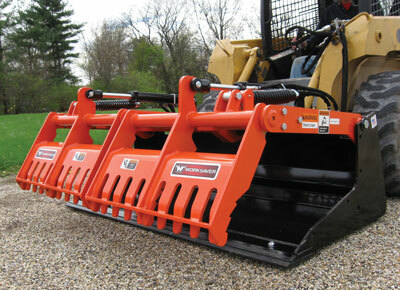 The adjustable skid maintains a constant cutting edge height preferred by the operator. 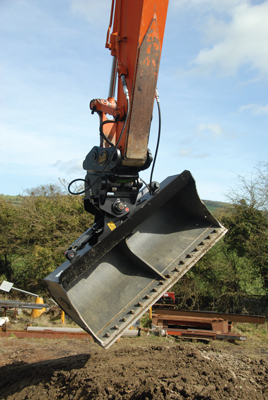 Even larger compact excavators need to be nimble and dexterous, and so do their buckets and attachments. That’s why we love the Geith tilting quick-coupler, which rotates any attachment up to 180 degrees, improving equipment versatility and productivity and allowing operators to complete more work in less time from the comfort and safety of the cab. A Geith tilting quick-coupler can save up to 25 percent of total machine operating time compared to direct mount couplers (says Geith), while the patented “curl-to-release” control system provides for safe attachment engagement and release. With proven technology that exceeds international safety standards, the Geith tilting quick-coupler is designed for use with excavators and backhoe loaders weighing between 6 and 26 tons. As its name implies, Cedar Eaters of Texas is a land clearing business with a focus on clearing the invasive Mountain Cedar in Texas’ Hill Country, but that’s not all they do. The company also offers Mesquite grubbing services. It is through the latter that Cedar Eaters of Texas’ owners acquired and created a pair of attachments to successfully perform their day-to-day grubbing operations. 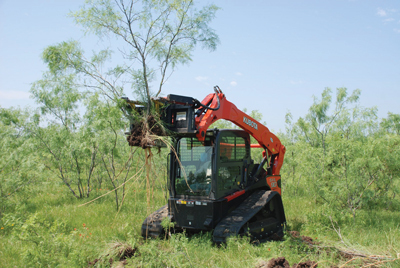 The patented Mesquite Grubber excavator attachment and the patented Root-N-All skid steer loader attachment both can help turn a mesquite wasteland into productive grassland by grubbing unwanted vegetation out by the root. Cedar Eaters of Texas’ excavator attachment, with retractable thumb, is for those with a large mesquite problem. 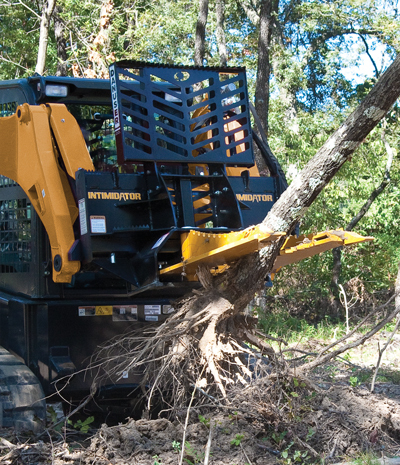 The skid steer attachment can handle many other invasive tree species as well. For more info, visit cedareater.com. When it comes to quality compaction, we suggest excavator owners try one of Case Construction Equipment’s five new plate compactors — the SC-30, SC-60, SC-80, SC-110 and SC-220. The plate compactors are ideal for utility work and are primarily used to compact the foundation in shallower trenches and prevent movement and ground upheaval. These plates run on unidirectional hydraulics and are available in a variety of sizes, ranging from 19 by 20 in. to 32 by 42 in. For soil compaction, the SC Series can compact up to 4 ft — more than five times the efficiency of handheld compactors. For slopes, the SC Series takes on the challenge of efficiently compacting materials on an incline. 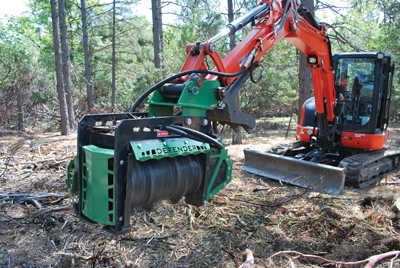 The new plate compactors can also drive and extract piles, fence posts, guardrails and more. 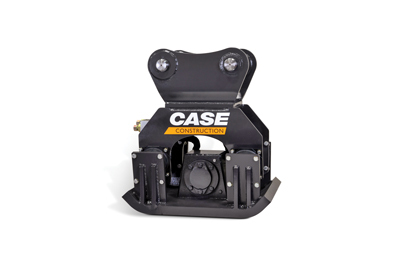 For more info, visit casece.com. Stump removal is annoyingly difficult work, unless you maybe have a Fecon Stumpex stump grinder for skid steers. 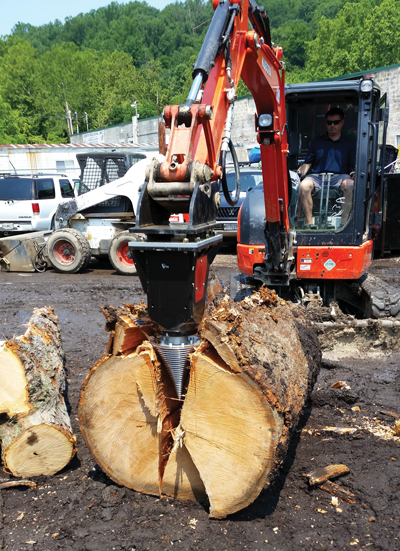 Low rpm and as much as 33,600 ft-lbs of torque at 4,000 psi enables the 1,500-lb Stumpex to draw itself down into any species of stump 10 to 28 in. in diameter and up to 20 in. deep in a single pass. And it uses as little as 20 gpm of hydraulic output. Larger diameter stumps are processed by making additional passes. A threaded cone and staggered AR500 cutting blades grind out the stump and root material with minimal discharge without requiring any fast-wearing carbide cutting tools. Stump chips stay mostly in the hole traditional stump grinders create, making cleanup after grinding with a Stumpex faster and easier. For more info, visit fecon.com. Brokk Inc. released one gnarly attachment with its TC120 Tank Cutter. 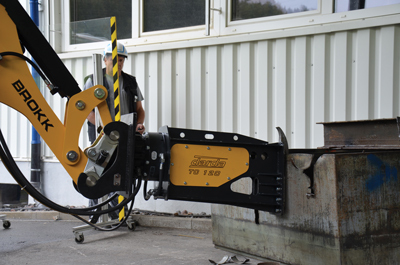 Manufactured by its sister company, Darda, this attachment delivers maximum cutting control and ultimate versatility for continuous steel cutting abilities that are unparalleled in the industry (says Brokk). The 47 by 17-in. TC120 Tank Cutter can be used with the Brokk 160, 260 and 400 models. The TC120 brings flexibility to the jobsite with its hydraulic rotation capabilities and 5-in.-wide jaws. It exerts 75 tons of cutting force at 7,250 psi to easily cut through half-inch thick steel plates. Although this attachment can be used in a variety of applications, such as in salvage yards and balers, it’s commonly employed for cutting steel tanks, pipes and vessels. For more info, visit brokk.com/us/. Cleanup calls for a bucket and grapple, and the Worksaver’s new Sweep Action Material Bucket (SAMB) is fantastic at cleaning large properties and construction sites. The patent-pending design allows the SAMB to collect demolition debris, brush or small rocks with one tool, offering time and cost savings. Two models are available, the SAMB-72 with an overall width of 72 in. and the SAMB-84 with an overall width of 84 in. The front grapple operates in a sweeping action to pull debris or brush into the unit for effortless site cleanup. The grapple design retains the debris, allowing operators to handle uneven size material without it falling out. Bolt-on side plates can be removed to reveal cutouts to handle loads of varying sizes. For more info, visit worksaver.com. 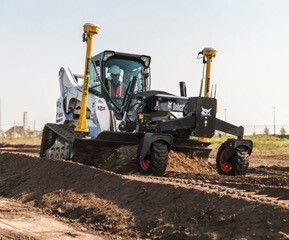 Small loaders (compact track loaders, specifically) can make formidable dozing and grading machines, which makes the new Bobcat grade control system exciting. A partnership between Bobcat Co. and Trimble has produced the first-ever 3D grade control system solution for use with Bobcat skid steer loaders, compact track loaders and all-wheel steer loaders. The Trimble GCS900 grade control system for use with Bobcat 96- and 108-in. heavy-duty grader attachments will offer both small and large contractors alike the ability to work on complex projects that require digital designs and 3D machine control. The new Trimble 3D grade control system allows operators to work at higher speeds without losing accuracy, increases valve responses and is a more robust grading solution. Cost savings and accuracy are just two of the big pluses contractors will see when utilizing Edge’s new Leica laser system with grader blade. The precise control that the grader and the laser system provide is perfect for ground preparation for parking lots and concrete building structure pads. The Edge Leica laser system features a simple one-person operation with its manual-axis-align feature, a high degree of accuracy over long distances up to 3,608 ft and a transmitter that features -5 to +25 percent grade capability in either axis (-5 to +15 percent in both axes). According to Edge, most of its competitors have a manually controlled leveling system without the accuracy of a laser, whereas the Leica laser system offers the complete laser/grader system package, which works with the machine’s hydraulic system. For more info, visit ceattachments.com. Not a hydraulic attachment in the traditional sense, the Cool Flow hydraulic oil cooler from Loftness Specialized Equipment helps skid steers stay just as productive. It greatly reduces the risk of overheating in skid steers and hydraulically powered attachments when operating in demanding applications and hot work environments. The automatic, thermostat-controlled fan provides adequate cooling to the system whenever needed to boost machine efficiency, even when an attachment is not being used. 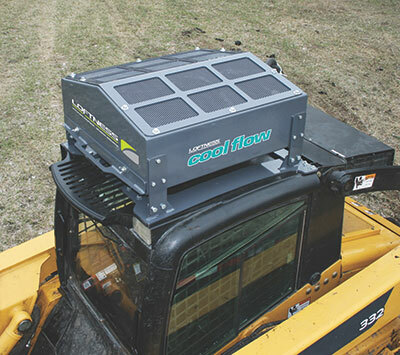 Unlike most other hydraulic coolers that are mounted near the attachment, the Cool Flow attaches to the roof of a skid steer cab where it is less susceptible to vibration, back pressure, debris and potential impact damage. Engineered to allow full hydraulic flow to the attachment in either direction without risk of damage to the cooler, this unique feature allows operators to run the attachment in reverse when needed, and it protects the unit in case hydraulic hoses are accidentally reversed. For more info, visit loftness.com.